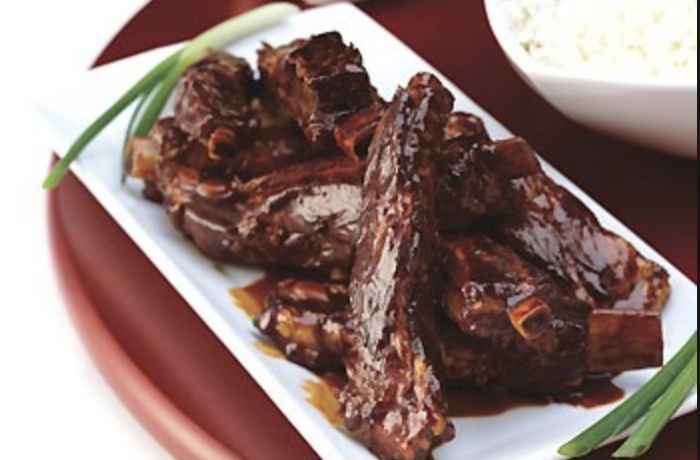 Cut spareribs into serving size pieces. Sprinkle with salt and pepper. Brown for 15 minutes in a sauté pan with a little cooking oil. Combine the chicken bouillon, brown sugar, white vinegar and Minus 8 Vinegar. Put the mixture into the slow cooker with the browned ribs. Cook on low heat for 6-8 hours. Then, turn to high heat and add the onion and cornstarch water mixture. Cover and cook for 15 minutes. Boil the Chinese noodles until tender during this time. Once the noodles are cooked and drained, toss with 1 tbsp olive oil and 1 tsp Minus 8 Vinegar. Add the mandarin oranges and green pepper to the crock pot. Cover and cook another 5 minutes. Serve the ribs over top of the noodles.